I recently posted the article “Recurring Symptoms of IME’s: Independent medical examinations have given rise to many complex issues,” 30 Pennsylvania Law Weekly 475 (May 7, 2007) outlining recent caselaw on a wide variety of issues pertaining to IME. The following additional, recent unpublished Northeastern Pennsylvania IME cases of note were brought to my attention by Attorney Marianne J. Gilmartin of the Scranton office of Stevens & Lee. I thank Attorney Gilmartin for sending these cases my way. In the case of Monahan v. The Manitowoc Company, Inc., et al., No. 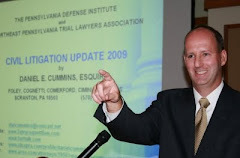 465 - Civil - 2005 (Luzerne County, November 2, 2007), then Judge Michael T. Conahan (ahem) issued an Order without any opinion addressing the issue of how far a plaintiff should have to travel to attend a multi-day neuropsychological IME. The Order offered two alternatives: (1) that the plaintiff travel down to the Bryn Mawr, PA office of the expert by the plaintiffs own means or by means paid for by the Defendants, or (2) that the plaintiff attend one portion of the multi-day IME with the expert at the local office of the defense counsel, followed by attendance at a second day of testing at the expert's office in Bryn Mawr, PA either by the plaintiff's own means or by means paid for by the defense. In the separate, more recent IME case of Chisarick v. Economic Development Council of NEPA, Civil Action No. 3:CV 06 0519 (M.D.Pa. April 17, 2009), Judge Thomas I. Vanaskie issued an Order without any opinion holding that the Plaintiff was precluded from being accompanied by his attorney or any other observer at an independent psychiatric evaluation (IPE). According to the Defendant's Brief filed in Chisarick, the issue was governed by an application of Fed.R.C.P. 35, pertaining to physical and mental examination prior to trial. Unlike the similar Pennsylvania state Rule of Civil Procedure 4010 pertaining to expert examinations, Federal Rule 35 is silent on the issue of whether counsel or a representative of the plaintiff may be present during such examinations. The defense brief argued that a majority of Federal decisions on the issue have ruled that the presence of counsel at an independent psychiatric evaluation would taint and/or obstruct the evaluation by causing a distraction, impeding communications and creating an overall adversarial atmosphere. See Shirsat v. Mutual Pharma. Co., 169 F.R.D. 68 (E.D.Pa. 1996); Neumerski v. Califano, 513 F.Supp. 1011 (E.D.Pa. 1981); but see Showell v. Trump Taj Mahal Casino, 2000 WL 1514108 (E.D.Pa. 2000)(Plaintiff's counsel allowed to attend IPE but only if he did not interrupt and sat silently behind his client). As noted, Judge Vanaskie chose to follow what the defense termed was the majority rule and he precluded the attorney or any representative from attending the IPE with the Plaintiff in this matter.